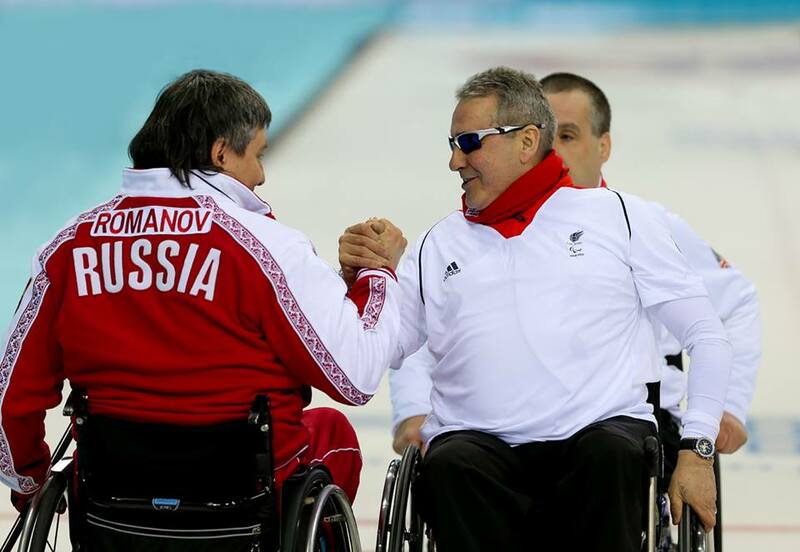 Sochi, Russia – Canada and Russia became the first two teams to qualify for the semi-finals of the 2014 Paralympic Winter Games wheelchair curling competition being played in the Ice Cube Curling Centre in Sochi, Russia. Russia created history by defeating Great Britain to qualify for the Paralympics wheelchair curling competition semi-finals for the first time. This comes shortly after making their Paralympic Winter Games debut earlier this week. For Canada, their win against Korea means that they still have the opportunity to defend the gold medals that they won in the Vancouver 2010 Paralympic Winter Games. Russia started well against Great Britain and after blanking the first end found themselves 4-1 up by the fourth end break. They remained in control throughout this game and took a crucial step towards their victory in the fifth end when their skip, Andrey Smirnov, made a take-out to score two points and gain a 6-1 lead. The hosts then went on to wrap up the game with a score of five points in the seventh end, which forced Great Britain to concede the game with the final score 11-2. This took Russia’s record to six wins and one loss which mathematically qualified them for the semi-finals. Canada joined them in the semi-final line-up as they defeated Korea, also in seven ends. After Korea stole one point to take the lead in the first end, Canada hit back straight away with a score of three points in the second end. They followed that up by stealing two points in the third end before Korea took one point back to make the score 5-2 at the fourth end break. Canada sealed their win in the seventh end with a score of four points as Korea skip Jong-Pan Kim was light with his last two draws. Korea then conceded the game with the final score 10-4, giving Canada their sixth win of the week and a place in the semi-finals. USA meanwhile picked up a second consecutive win, this time against China to keep their semi-final qualification hopes alive. The USA raced into a 4-0 lead by the fourth end break and although China took two points in the fifth end that was the only end they would score in. 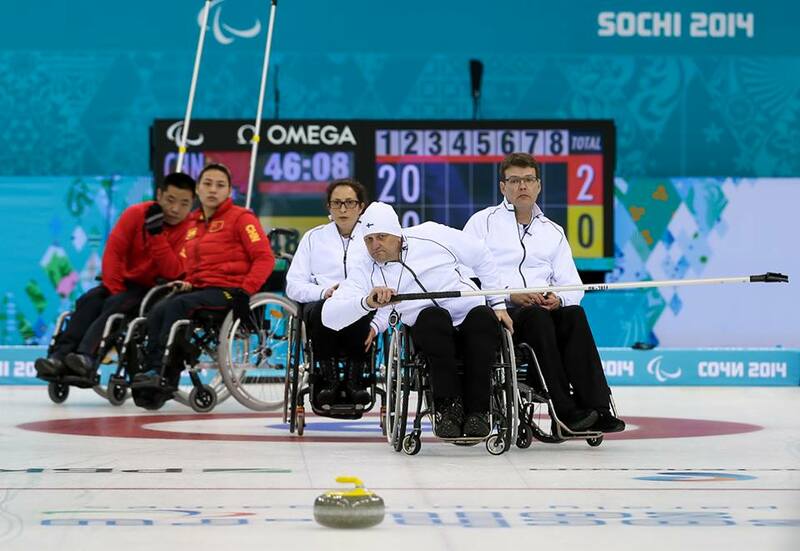 USA rounded out the game with a score of two points in the sixth end and stole four points in the seventh end at which point China conceded with the final score 10-2. The fourth and final game of the morning session was between Norway and Slovakia with both teams still focused on reaching the semi-finals. Slovakia began by stealing three points to give them a lead that they would never lose in this game. They followed that up by stealing another two points in the second end to give them 5-0 advantage. In the fifth end Slovakia skip Radoslav Duris made a take-out before Norway skip Rune Lorentsen missed and open draw to the eight foot ring to give up a steal of two points, giving Slovakia an 8-1 lead. 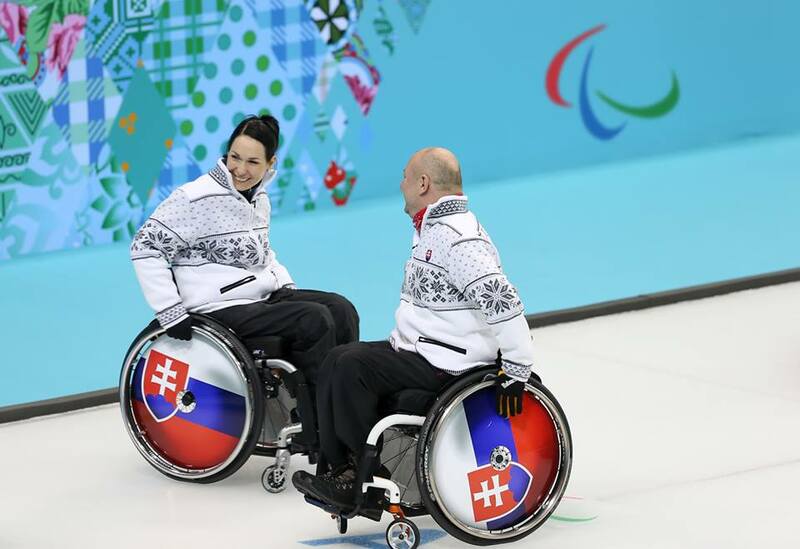 The game finished after seven ends of play with the final score 11-4 to Slovakia who finished the day on four wins and three losses, in joint third place alongside Great Britain. In the afternoon, Russia kept up their fine form in front of a packed home support as they picked up a last end, last stone victory over Norway. Norway were ahead 5-3 after five ends before Russia began their comeback. In the sixth end, facing three Norwegian stones, Russia skip Andrey Smirnov played a raise with one of his own stones that was sitting at the front of the 12 foot ring, moving it up to the button to score one point. Russia then stole in the next end, before, in the eighth and final end, Norway skip Rune Lorentsen’s attempted raise was light which gave up another steal of one point to hand Russia a 6-5 victory. USA made it two wins from two today as they defeated 2010 Paralympic Winter Games bronze medallists Sweden. Although the game was tight throughout the first few ends, the turning point came in the fourth end. USA skip Patrick McDonald made a draw around a guard onto the button with his first stone. Swedish skip Jalle Jungnell then missed his next two shots which eventually gave USA a steal of three points and a 5-2 lead at the fourth end break. USA saw out this game, winning 8-3 after seven ends of play, keeping their semi-final hopes alive going into the last day of round-robin play. The only other game in the afternoon session was between China and Finland. With last stone advantage in the first end, China picked up two points. 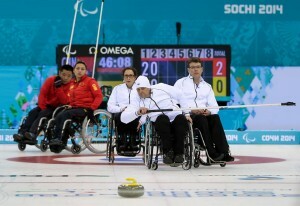 Then, after Finland blanked the second end, China stole two points in the third end to take a 4-0 lead. Finland could never get back into the game and when Finland skip Markku Karjalainen missed a takeout with his last stone in the sixth end, China skip Haitao Wang was left with a draw to score three points to take the score to 7-2. After seven ends of play, Finland conceded defeat with the final score 8-2 which left them at the bottom of the standings after five days of play, while China are in fifth position with four wins and four losses. The four top ranked teams after the round-robin, and tie-breakers if required, will qualify for the semi-finals. The team ranked first will play the team ranked fourth, while the team ranked second will play third. Both semi-final winners will go into the gold medal game while the losers will play for the bronze medals. Both the semi-finals and the medal games will be played on Saturday, March 15. The final day of round-robin play begins tomorrow at 09:30 followed by another session at 15:30 (both times MSK).